I get to celebtate National Crochet Month with Crochetville today!! What better way to celebrate than with a brand new FREE pattern!!?? tdtks: Yarn over, pull front loop of stitch from previous row to the right, insert hook into the center of the stitch from previous row. Yarn over, pull through. Yarn over, pull through first two loops on your hook. Repeat to the end of the row, return pass. Row 2: Ch. 1, tdtks across. Return pass. 12 dtks. Row 3-23: Repeat Row 2. Row 28: Attach your ponytail holder during this row. Ch. 1, sc around the ponytail holder across. 6 sc into pony tail holder. Finish off, weave in end. Reattach yarn to the first row. Row 1: ch. 1, sc across. 12 sc. Row 5: Attach to your pony tail holder during this row, being careful not to twist your headband. Ch. 1, sc around the ponytail holder across. 6 sc into pony tail holder. Finish off, weave in end. This pattern is written and distributed by Darcy’s Crochet Creations. Feel free to sell, gift or donate any items you make using this pattern. Please provide a link to where you got the pattern when writing up your descriptions. Pattern sharing is not nice or cool, it’s theft. Sharing and/or copying of this pattern is not permitted. Today starts National Crochet Month! How wonderful!!??!! Crochetville does an annual blog tour of designers, yarn companies and crafters and this year, I am honored to say I get to be a part of it!!! I hope you enjoy all of the amazingness, join the community and share in the crochet love! Have you ever wondered what to get that special crafter in your life? Well now, you can give them something totally unique and guaranteed to make them smile! Who doesn't love a gift card? Who doesn't love the chance to improve their craft, learn a new skill or just find amazing information to help with every day life? Well Creativelive can help with that now!!! If you want to take a look around at the CreativeLive site before making your purchase, here is a class that I've taken that has helped my Etsy store dramatically!! I can't wait to hear about your excited gift recipients this year!! Let me know who you are getting a gift card for!! See you soon with more great goodies!!! Did you notice the fun that went down on my Facebook page yesterday? I released a brand new pattern! I love the basket weave look to crochet. I also love learning new skills and stitches. This new pattern has BOTH of those things!!!! One of my all time favorite stitches is the Half Double Crochet. What else is amazing!!? The EXTENDED Half Double Crochet! Yep, you got it! It's not quite a Double Crochet but it's an extended Half Double Crochet! I wrote this pattern with a lighter weight yarn which makes the finished items perfect for fall, early and late winter and spring! It will keep your hands/wrists warm without feeling like you're going to melt. You can make your Frosty Fingerless Gloves with one color, two colors or 15! I love how customizable this pattern really is!! For this week ONLY, you can get the pattern for $2.00, which is 50% off! No coupon needed!!! The price will go to $3.99 on the 19th! Remember, share your finished projects on Ravelry! I LOVE seeing your creations!!! Yep! I'm bringing you something else AMAZING today!!! That's right, two great things on one Monday! Who does that!??! Well, I do! When I find something that I love, I just HAVE to tell you about it right away!!! I have recently signed up with CreativeLive! First things first, you might ask "What in the world is CreativeLive!??!" Well, CreativeLive is an amazing online community where you can find information and classes on topics such as Crochet, knitting, growing your business, to self improvement and marketing! There is such a wide variety of classes that you can take, it's unreal! I have recently had the joy of taking a class on making my Etsy store better, more streamlined and more user friendly! I have learned so much information to make my Etsy store the best it can be! I have learned about photography, marketing, descriptions of my items and other information that is going to make my store more welcoming, inviting and more attractive to potential customers! I really encourage anyone with an Etsy store to check out the class "Turning Your Etsy Shop Into A Sales Machine." If you're interested in the class I've taken, you can click on my affiliate link below to go right to this class! If you're interested in other classes, you can search for them right from this link too! This is my affiliate link so if you purchase anything through this link, I get a small commission from it. Please let me know what you find interesting, what classes you're interested in and what classes you've signed up for!! Today starts a new day, a new week and a HUGE sale at Knit Picks! There is major savings to be had for this week! Have you ever used Knit Picks yarn? It's pretty amazing! The Brava Sport and Brava Worsted are FABULOUS! I have had the joy of working with both recently! They are soft, easy to work with and just all around amazing. The texture that is created with these yarns is just what makes crochet fabulous! 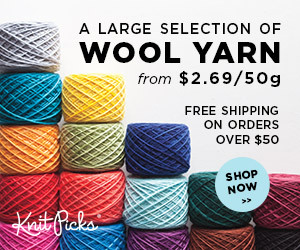 Grab your favorite yarns and find some new favorites this week only at Knit Picks!! I have included my affiliate link on this post for you to enjoy the savings!! Have fun shopping and don't forget, I would LOVE to see what you score!! !